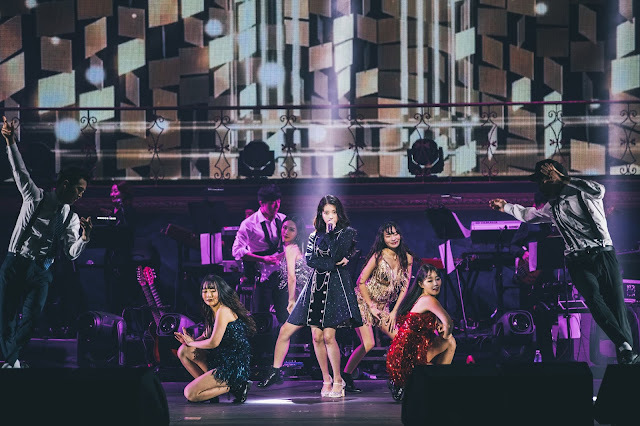 The female lead of ‘Scarlet Heart: Ryeo’, better known as hit singer IU, brought the house down during her solo concert ‘dlwlrma’ on Saturday night at The Star Theatre! The nation sister adorably shared that this is the first time she’s setting foot in Singapore, and that she was really excited to be here! She went on to add that she was even more amazed after seeing Singapore in person (compared to seeing Singapore onscreen), and that she has fallen in love with the city. Although she was extremely apologetic towards her fans for not realizing that her fanbase here was so strong. 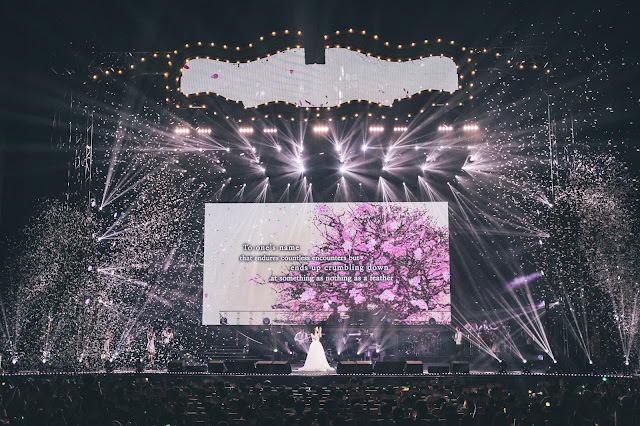 Throughout the 2-hour long show, she performed an array of songs ranging from classic hits such as ‘You & I’, ‘Only I Didn’t Know’, to slow ballads such as ‘Through the Night’. Fans even got to witness IU’s famous 3 high notes from ‘Good day’! The concert was planned such that it showed IU’s journey through the past decade (from debut till now); a series of trailers through various eras which complemented each performance set. 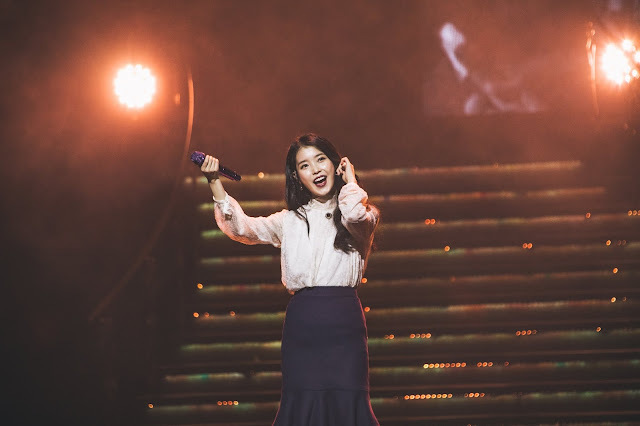 It was easy to see how much IU loves her fans because she was awed by how they sang along perfectly in Korean – ‘I got goosebumps! I know how difficult it is to sing in another language, I really know but you guys were perfect. Thank you for trying for my sake. Now it is my turn, and I heard that a lot of my 싱애나() asked for this song, so this is my gift to you guys.’ She then took the crowd by surprise by singing Karen Mok’s ‘爱’. The surprise continued when IU took the chance to dedicate a song to Jonghyun, who passed away last year. Before the stage, IU explained that the song was never in the original setlist but it was (and still is!) a great source of comfort for her ever since she met the song, ending off with, ‘I hope this song will reach the person I really miss’. After which, she swapped her usual purple microphone for a pearl aqua microphone, and ‘Gloomy Clock’ came on. The singer shared that when she was younger, she used to pay attention to the people who disliked her, resulting in songs with dark and sharp lyrics. However, she has noticed that she has shifted her focus to love instead, and that the fans are a great source of comfort for her, as well as the reason why she has started to learn to love herself. She also explained how she is starting to leave behind the adorable image over time and that this tour would be the last time that fans will witness ‘Marshmallow’ and ‘Boo’ on stage. However, IU’s cute antics with the marshmallow mascots were definitely worth it! During the ending ment, IU shared that the Singapore stage/studio was a surprise to the team because of how luxurious everything was. She even added on that it was a dream for most singers, and she was so glad that she had the chance to experience it. Adding on to the good memories in Singapore, fans held up banners and fingerlights that mimicked fireflies when IU sang ‘Dear Name’ during the encore! 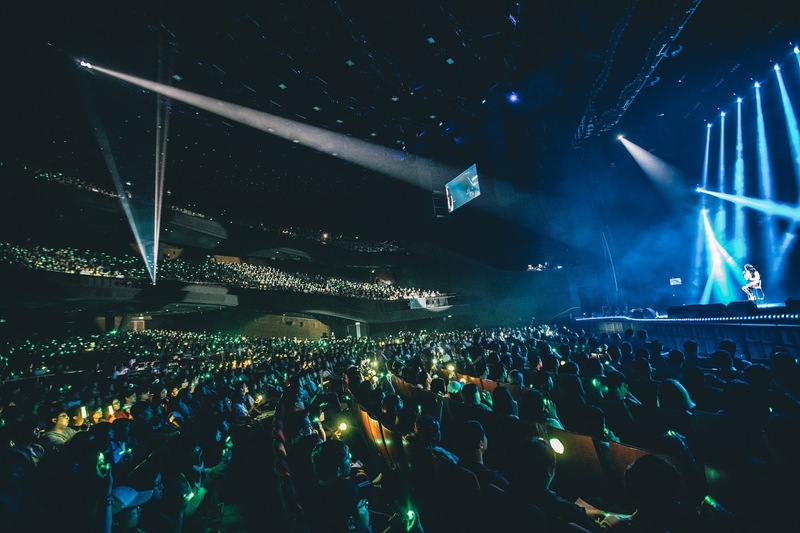 They got IU’s seal of approval because she happily announced that the lights really looked like fireflies and it was a sight that she had never seen before. The singer even returned to the stage for an en-encore after changing out of stage attire to perform ‘Shower’ and ‘Heart’ before wrapping up the entire show! No worries for those who couldn’t make it for her ‘dlwlrma’ show because the singer has promised that she will be back on our shores again next year! She revealed that she has plans to bring her family her for a vacation, and that many of her personal friends lived here too, so when she is here, all she has are good memories! Is she hinting at another event next year as well? We’ll all be anticipating even more good news from IU for 2019! We would like to thank One Production for the invitation to cover such a spectacular event.